Falls Church, Virginia. JAVA quarterly lunch featured two major events, a keynote address by Teresa M. Takai, Acting Assistant Secretary of Defense and Chief Information Officer (CIO) of the Department of Defense (DOD) and the presentation of JAVA’s Courage, Honor, Patriotism plaque to retired Ambassador John R. Malott, on March 29, 2014 at the Harvest Moon Restaurant at Falls Church, Virginia. Takai discussed her birth and early life in the Detroit, Michigan, area, education at the University of Michigan (BA in mathematics and MA in management), and her 30-year career at Ford Motor Company, where she led the development of the company’s information technology strategic plan. Beginning in 2003, she served as Director of the Michigan Department of Information Technology (MDIT) and as the state’s Chief Information Officer (CIO). She then served as the State of California CIO, a cabinet level position, from which she advised the Governor on information technology matters and led more than 130 CIOs and 10,000 information technology employees spread across the state’s different agencies, departments, boards, commissions and offices. She described her responsibilities and challenges of her present Defense Department position to which she was appointed on October 26, 2010. During his 31-year Foreign Service career, Ambassador Malott served as ambassador to Malaysia, deputy assistant secretary of state for South Asian Affairs, and consul general in Osaka, Japan. He also held positions as director and deputy director of the State Department’s Office of Japanese Affairs and as American consul in Kobe, Japan and Bombay, India. 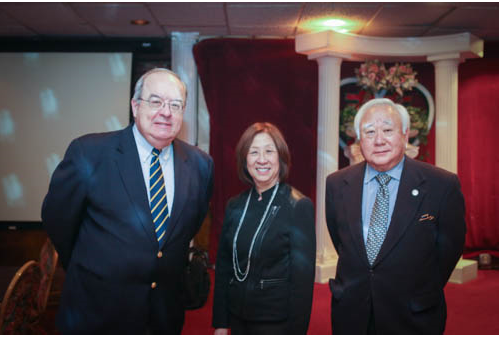 As President and Chief Executive Officer of the Japan America Society of Washington (JASW), Malott has invited JAVA to partner with JASW, including participation in speaking programs and the provision of a booth at the JASW annual Sakura Matsuri which is held in conjunction with the National Cherry Blossom Parade. This venue allows JAVA to contact the American public not normally reached through traditional programs. In presenting the Courage, Honor, Patriotism award to Ambassador Malott, Gerald Yamada, Japanese American Veterans Association (JAVA) President, recognized the partnership between JAVA and the JASW. In his acceptance remarks, Ambassador Malott affirmed this close relationship. The annual Freedom Walk will be held on Saturday April 5th starting at 9 a.m. at the National Japanese American Memorial to Patriotism in Washington, DC. The Honorable Jodie Bernstein, Chair of the Commission on Wartime Relocation and Internment of Civilians, will be the keynote speaker. Lieutenant Colonel Marty Herbert, USA (Ret) is JAVA’s representative to the Freedom Walk Committee. The National Cherry Blossom Festival will be held on Saturday April 12th starting at 10:00 a.m. in downtown Washington, DC. JAVA will again have a booth provided by the generosity of JASW. Mr. Rueben Yoshikawa is in charge of this event. The Memorial Day Service on May 25, at Arlington National Cemetery. This annual event, held jointly with Japanese American Citizens League (JACL), Washington, DC, honors some 80 Japanese Americans who have fallen in the service of our country. The program includes the laying of a wreath at the Tomb of the Unknown. Lieutenant Jason Osuga, US Navy, is JAVA’s acting organizer for this event. The National Memorial Day Parade on May 26 down Constitution Avenue sponsored by the American Veterans Center. JAVA has participated in this event since its inception about 10 years ago. The 442nd Regimental Combat Team marched down this same avenue on July 15, 1946, when it was reviewed by President Harry Truman. Lieutenant Colonel Marty Herbert, USA (Ret) is the JAVA organizer for this event. The next JAVA luncheon is scheduled for July 12th, which will feature our annual scholarship awards. The scholarship committee is composed of Chair Wade Ishimoto, Colonel Derek Hirohata, US Air Force, Captain Cynthia Macri, US Navy, and Lieutenant Colonel Mike Yaguchi, US Air Force (Ret). Luncheon attendees bade a warm farewell to Connie Ishio, widow of COL Phil Ishio, USA (Ret. ), Military Intelligence Service veteran and Founding President of JAVA, who is moving to Arizona to be closer to her family members. She was presented with a JAVA Service pin.